This is the Christmas card we sent out this year. Isn't it BEAUTIFUL!!? I just love it!! Thank you to my friend Amber from White Horse Photography! She did such a great job!!! I look forward to continuing to do this year after year. Since Christmas is right after our anniversary, i kinda consider them anniversary pics, ya know?! I think it'll be interesting & fun to see the changes year after year! You'll notice these pics are kind of around the blog now. To your right. And i put the one of us on the bench (my FAVORITE!) at the bottom! It's the color version & just perfect! Take a look! 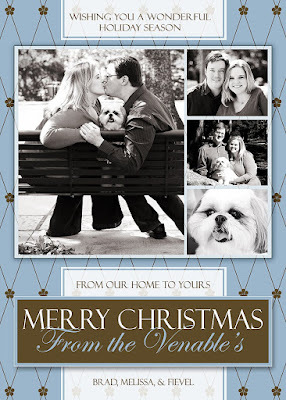 totally love the christmas card.. i love the bench pic with your dog!! how cute!! it is awesome!!! i like having my dog in our christmas pic too!! Seeing your pics makes me want to go get some done... I'm just too cheap about it right now. I'm with the others I LOVE the bench pic!! SO cute. Your Cards are precious!! I Like the colors too!! We're lucky to have missed the rain here. I hate rain! Love the photos!! Your card turned out great!! !